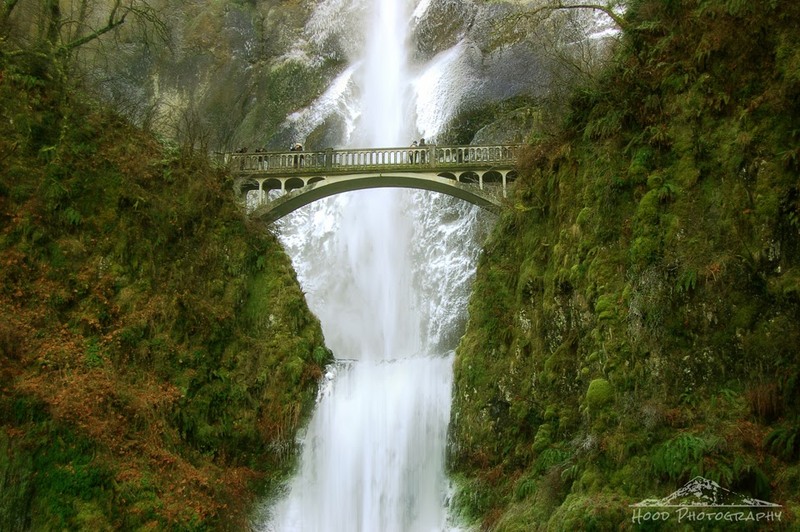 Today's photo is a tribute to Benson Bridge, which spans in between the upper and lower tiers of Multnomah Falls. Two nights ago, a rock presumably fell and hit the north side of the bridge, right about where the people are standing in this photo, knocking a huge chunk out of it. I hope to get up to check out the damage at some point soon, perhaps even this weekend if I am lucky. But until then, here is a photo I took this time last year, and I hope they are able to repair it quickly and back to this original glory. It is a beautiful scene with the bridge and waterfalls. One of my favorite spots along the Columbia River. Great shot! Great photo and symmetri. Nature is fantastic. I was just up there the Sunday after Christmas, and hiked down the Larch mtn trail and across this bridge. So sad to hear about the damage. Looks pretty serious. Those folks will get it fixed, I'm sure. I love this photo of such a beautiful sight. Wow, that's a remarkable scene! Gorgeous place, love the look of the falls and the bridge. Gasp! I was just on that bridge last spring! I spend most of my life hopping between Vancouver Island and Florida, but the Columbia River Gorge has become a family favourite. I hope they get it all fixed up because I will be in the area in a couple years hopefully. Gorgeous shot, and what a beautiful location!